The present 19th Congress of the Communist Party of China (CPC) occurs on the 20th anniversary of the Asian financial crisis and the 10th of the US subprime mortgage collapse which ignited the international financial crisis. This necessarily leads leads to analysis of the achievements and trends of China’s economy in comparison with these major crises and of China’s relations with the rest of the world. Such comparisons are even more necessary because as will be seen these crises were not purely historical events but their effects continue to shape the present international situation at the time of the 19th Congress. To summarise the results, both the Asian crisis and the US sub-prime crisis showed in a striking practical way the economic superiority of China’s ‘socialism with Chinese characteristics’ to the Western capitalist system – China was able to come through these two crises with little economic damage, unlike the West. Indeed, China’s success during these crises sharply increased its weight within the global economy. These events therefore demonstrated the superiority of ‘socialism with Chinese characteristics’ not merely in an historic sense but as China’s best defence confronted with current problems in Western economies. Analysing first the 1997-98 Asian financial crisis, this had devastating effects on most Eastern Asia developing economies. In 1998 South Korea’s economy contracted by 6%, Malaysia’s by 7%, Thailand’s by 8%, and Indonesia’s by 13%. Knock on effects depressed the regions advanced economies – both Singapore and Japan’s economies declining. Given the devastating effect on East Asian developing economies Western commentators predicted China would be affected by economic crisis – a prediction which turned out to be totally false. In 1998 China’s economic growth was 7.8% and in 1998 7.6%. In contrast to the other major East Asian developing economies China came through the Asian financial crisis without significant economic slowing. The 2007 US sub-prime mortgage crisis inaugurated an even more severe international crisis as it originated within the US creating the worst world economic crisis since the post-1929 Great Depression. Under the impact of the US crisis the world economy contracted in 2009 for the first time since the aftermath of World War II. The US economy in 2007-2009 declined by 3%, its worst performance since the Great Depression. But even more serious cumulatively growth in the advanced Western economies entirely failed to regain its pre-international financial crisis rate. IMF managing director Christine Lagarde accurately described the post-2007 period in the Western economies as a ‘new mediocre’ – average annual economic US growth in 2007-2016 was only 1.3%, in the EU 0.6% and in Japan 0.4%. Despite this most severe global crisis for almost a century China’s economy continued rapid expansion. In 2007-2016 China’s economy grew by 106% – compared to only 9% in the US, 6% in the EU and 3% in Japan. The combined effect of China’s rapid economic development with the West’s ‘new mediocre’ therefore sharply changed the situation in the world economy. China not only raised its own population’s living standards amid the extremely negative effects of the international financial crisis, but China became the most important support of the world economy. In 2009, the crisis’s worst year, China’s GDP increase was greater than the whole of the rest of the world. In 2007-2016 overall China was responsible for 44% of world growth. These trends created a ‘win-win’ outcome between China and the rest of the world – practically confirming Xi Jinping’s concept of a ‘community of common destiny’. China’s economic expansion aided China’s own people, while Western living standards were falling, but China’s growth aided world economic recovery – thereby avoiding greater international problems for China itself. These two financial crises demonstrated in the most practical way the superiority of China’s ‘socialism with Chinese characteristics’ compared to capitalism. In capitalism the economy is entirely dominated by private ownership of the means of production. In the US, for example, 83% of investment is private and only 17% state – with no large state banks which can provide easy finance for private company investment. Therefore, when the collapse of the sub-prime mortgage market led to plummeting US private investment, which fell 24% in 2006-2009, there was no state mechanism strong enough to prevent the US falling into severe recession. This repeated the experience of the Asian financial crisis, when investment in South Korea fell 21% in 1997-98, while in 1997-1999 investment fell by 45% in Indonesia and by 47% in Thailand and Malaysia. In contrast China’s ‘socialism with Chinese characteristics’ has a powerful state sector which in a crisis can maintain investment and powerful state banks which can lend to private companies. Over 35% of China’s fixed investment is by the state. Therefore during the Asian financial crisis, while investment was falling sharply in other Asian economies, in China it rose by 22% in 1997-1999. During the sub-prime crisis, while in the US total investment fell by 18% in 2006-2009, In China it rose by 54%. China’s ‘socialism with Chinese characteristics’ was therefore the direct reason China came through the two great international economic crisis without the severe problems which affected the Western economies. 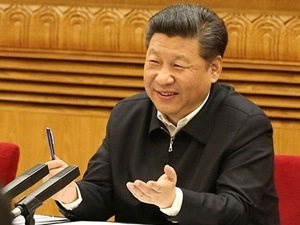 Within China’s economy the state and private sectors worked together, illustrating the point made by Xi Jinping that China could use both the ‘visible’ and ‘invisible’ hand’ – a much more powerful mechanism than the purely ‘invisible hand’ of private Western capitalist economies. However, while China successful economic development after the US sub-prime mortgage crisis showed the superiority of China’s economic system nevertheless the simultaneous combination of China’s economic success with the West’s ‘new mediocre’ created a new international economic situation. China’s post-1978 ‘reform and opening up’ had produced far more rapid economic development than the West – China’s average annual economic growth in 1978-2007 was 9.9% compared to 2.6% in advanced Western economies. Nevertheless, in that period significant growth in the Western economies created a favourable international economic context for China – all major economies grew with China growing faster than any other. China’s economic growth in this period successfully achieved ‘upper middle income’ status by World Bank classification, within striking distance of its immediate goal of ‘moderate prosperity’. But the West’s post-2007 ‘new mediocre’ created a new international context in which China had to make the transition to ‘moderate prosperity’ amid slow Western growth. To understand how different is the international economic situation facing China now compared to before the international financial crisis, it may be noted that the highest circles of Western economic experts now understand that while the international financial crisis did not produce as great a fall in output as in the Great Depression long term Western economic growth will is slower than after 1929. Internationally the situation is more severe. By the end of 2017 total growth since the international financial crisis in advanced Western economies will be slower than after 1929 – 12.3% in the 10 years after 2007 compared to 15.1% in the 10 years after 1929. IMF projections are that by 2021, fourteen years after 2007, annual average growth in the advanced economies will be less than half that in the same period after 1929 – 1.3% compared to 2.9%. economic orthodoxy, which cannot be accused of pro-China and anti-Western bias, analysing the IMF’s projections for the five years after the 19th Party Congress shows clearly that China will continue to face a situation of slow Western growth. The IMF does not doubt that China itself will achieve its target of ‘moderate prosperity’ by 2020. Indeed, the IMF projects China will achieve the World Bank’s criteria of a ‘high-income economy‘ by 2021/2022. The IMF estimates that in 2016-2022 China’s economy will grow by $7.1 trillion, compared to a US $4.8 trillion, with China accounting for 28% of world growth, compared to 18% for the US and 16% for the EU – China will be the largest motor of world growth with its contribution to global GDP expansion being almost half as much again as the US. ​Such very slow growth in the West does not just have direct economic effects on China, as with exports. It changed China’s geopolitical context – which was met with successful initiatives in foreign policy, global governance and military reform since the 18th Party Congress. This international economic situation, as well as China’s domestic one, therefore explains why these initiatives were so successful. In global economic governance, as the Western economies were in a ‘new mediocre’ they were unable to take the initiatives leading the world economy forward which other economies as well as China required. China therefore took increasing initiatives. These were underpinned by Xi Jinping’s fundamental concept of a ‘community of common destiny’ and included major practical initiatives such as One Belt One Road and very high-profile defence of globalisation by Xi Jinping at the Davos World Economic Forum earlier this year. These became still more significant when protectionism was adopted by forces within the US. The impact of China’s global initiatives may be simply noted from the Financial Times headline regarding this month’s annual meetings of the IMF and World Bank: ‘China moves in as US pulls back from global institutions’. It noted World Bank president Jim Yong Kim’s analysis: ‘the accolades this week have been directed at China’s president Xi Jinping. “I quote him all the time,” Mr Kim… told a packed room on Thursday as he invoked Mr Xi’s call earlier this year for a defence of free trade and internationalism. “In a period where we see countries becoming more inward looking, in a period where we see countries becoming more nationalistic what President Xi said at Davos was extremely important”. Geopolitically slow growth in Western countries led to popular discontent within them and increased international instability – for example in the Middle East. In some cases, the traditional Western political elites lost control of key decisions – as with the UK’s economically irrational vote to leave the EU. In the US Trump was elected president against the overwhelming majority of the political establishment. While China has strongly promoted peace, such risk of international instability justifies focus on military reform strengthening the PLA. In summary, China’s domestic transition to moderate prosperity, combined with the new mediocre in the Western economies, required a successful series of international initiatives since the 18th CPC Congress. This will continue at the 19th with great consequences not only for China but the global economy. This is a slightly expanded version of an article originally published in Chinese by Global Times.